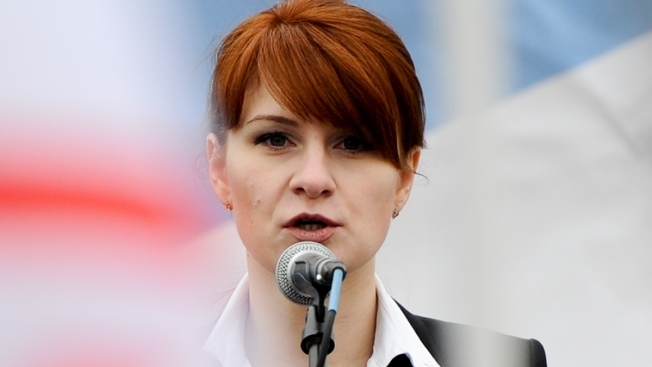 FILE - In this Sunday, April 21, 2013, file photo, Maria Butina, leader of a pro-gun organization in Russia, speaks to a crowd during a rally in support of legalizing the possession of handguns in Moscow, Russia. Maria Butina, the accused Russian agent of influence who built ties to the National Rifle Association and influential Republicans, has agreed to plead guilty and cooperate with federal prosecutors, according to a plea agreement obtained by NBC News. The case was not brought by special counsel Robert Mueller. According to the documents, Butina — a former graduate student at American University in Washington, D.C. — will admit to conspiring with an unnamed American to act at the direction of a Russian official "to establish unofficial lines of communication with Americans having power and influence over U.S. politics…for the benefit of the Russian Federation." The unnamed American has been identified by law enforcement officials as Paul Erickson, a longtime Republican activist who was in a romantic relationship with Butina. Click through for the full report from NBC News.